Okay, this grilled cheese sandwich is legitimately amazing. You can make it with Brie or with a good triple cream. I told the cheese monger at my local supermarket what I was making and they suggested a brie that didn’t have a super “mushroomy” taste to it and I thought it turned out great. Do you know what the key to a great grilled cheese is? It’s all in how you cook it! Here’s how I made this. Begin by turning on your electric griddle to 400 or as high as it will go, leave it alone while it warms up. In a cast iron skillet, cook your bacon on medium low (level four) on your stove. I like to cook my bacon “low and slow” to avoid burning it and smoking out the house. It also helps control splatter outside of the pan. Cook the bacon to your liking, remove and drain on a plate with a paper towel to remove excess grease from bacon. Turn oven off and sit skillet aside. 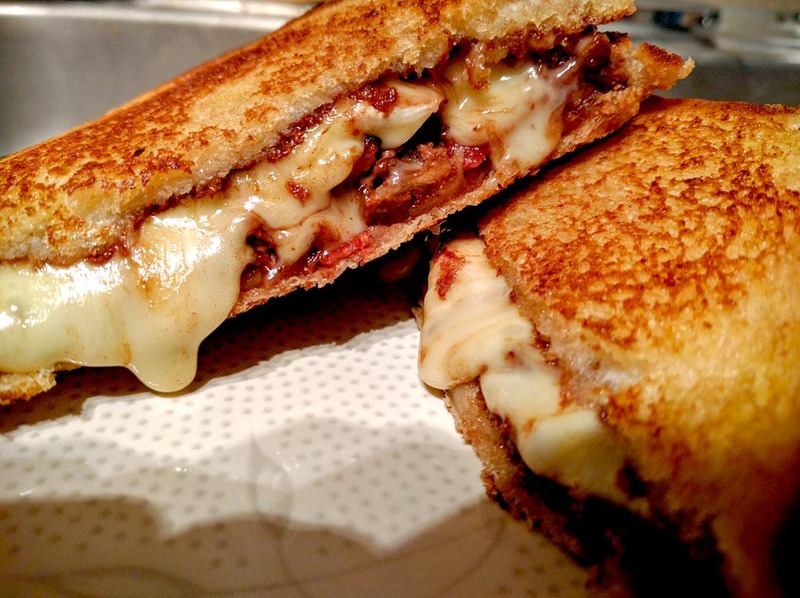 Once the bacon is done, turn your attention to your grilled cheese. This is where the magic happens. Begin by taking a small amount of butter from the block and cutting it in half down the middle. You’ll use one dollop for each piece of bread. By now your griddle should be piping out. Add butter, moving it around the griddle with the knife until it’s almost completely melted. Take your Texas Toast and add it to the griddle. Cook your bread until it’s golden on the bottom, check it every few minutes. Remove the bread from the griddle and place on a cutting board, golden side up. Take one side of the bread and spread on the Nutella and add the bacon on top. On the other piece add the Brie. If the rind of the Brie is tough, you’ll want to trim that off. If your Brie has been sitting out, it may have softened and could be easier or tougher to work with. Slice off some more butter and add it back to the griddle. Move the butter around to make a large working area for the sandwich. Take your bread and add it back to the griddle, with the uncooked side on the bottom. As the sandwich continues to cook, the heat will rise through the bread, melting the cheese and Nutella. Once almost golden on the bottoms, I join the sandwich sides together and finish cooking it. When done, remove, cut diagonally and serve immediately. If you’re feeling adventurous, you could also add bananas. You could even grill the bananas and caramelize them in the skillet after the bacon is done cooking and you’ve drained the excess grease.